The CogAT (Cognitive Abilities Test) is a reasoning and problem-solving exam that is used to quality Kindergarten through 12th grade students for gifted and talented programs. The test is comprised of a verbal battery, quantitative battery, as well as a nonverbal battery. Each battery is further broken down into three distinct subtests that focus on a specific area of the student’s cognition. Currently, CogAT Form 7 and 8 are the most current and widely used editions of the test. The CogAT questions are specifically designed to target the different academic areas for each grade level. Specifically, the Kindergarten CogAT is intended for students who are five to six years old. In total, the CogAT is made up of 118 questions. One aspect of the exam that is unique to Kindergarteners, is that these students do not need to record their answers using bubble sheets. Bubble sheets typically aren’t used until the first or second grade. Like all of the other grade levels, the Kindergarten test assesses the students’ quantitative, verbal and nonverbal abilities. Still, because the student is expected to be in the early stages of reading, there is less of an emphasis placed on verbal abilities. Instead, words are replaced with various images and figures. All reading is performed by the designated test administrator. While this version of the CogAT is cognitively appropriate for Kindergarten students, the exam also includes questions that students have not yet learned. As a result, the student is required to put their reasoning and problem solving skills to the test when approaching each question. Below are several CogAT sample questions that are intended for the Kindergarten level. Each practice question will reflect a specific subtest that your child will come across. Parent Say to Child: Look at the example below. Do you see how the first tugboat is pulling a tugboat with 3 red boxes? Now look at the second tugboat. It is pulling one boat with 2 red boxes. We need to add another boat where this question mark is so that this tugboat will be pulling the same number of red boxes as the first tugboat. Which boat should we add so the second tugboat will be pulling 3 red boxes. In the figure classification subtest, the student is presented with two rows of figures. The top figures are all similar is some way. 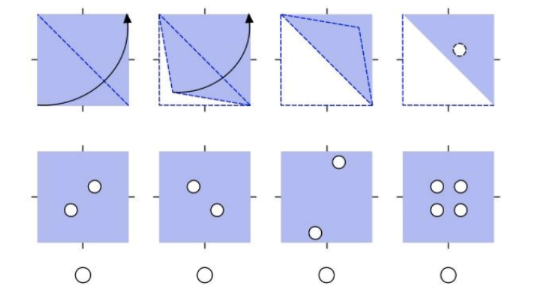 The student is required to choose one figure from the bottom row that goes with the top figures in the same way that the figures on top fit together. For the verbal analogies subtest, the child is presented with a pair of items on top that are related to each other in some way. The child must decide how they are related. Then, the child must choose a picture from the possible answers that will have the same relationship with the picture on the bottom left. Parent say to your child: Look at the two pictures on top. They go together in some way Now look at the picture in the bottom box, and then look at the answer choices. Do you see a picture among the answer choices that goes with the picture on the bottom the same way the pictures on top go together. Parent say to child: Look at the example below. This is an abacus. The beads in the first 5 rods form a pattern or follow a rule. The beads in the sixth rod are missing. Can you choose the rod that goes in the sixth place that would complete the pattern or follow the rule. In the paper folding subtest, the child sees a series of pictures that show a piece of square paper being folded. Then, one or more holes are punched into the paper. The child must choose the answer that shows what the paper will look like when it is unfolded. Parent say to your child: Take a look at the pictures across the top. They show a piece of square being folded. Then, one or more holes are punched in the folded piece of paper. Can you point to the answer that shows what the square piece of paper will look like when it is unfolded. 1.) The boat over the second bubble is the correct answer. 2.) 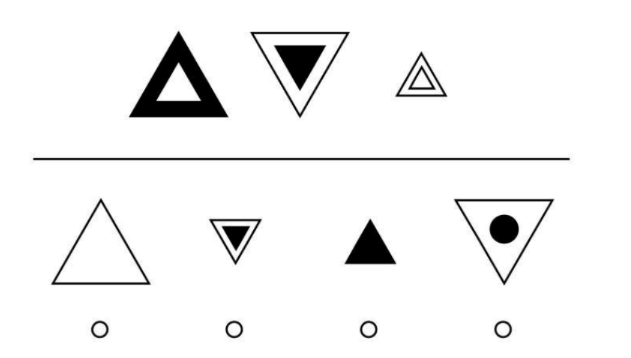 Option 2 (a triangle with a triangle inside) is the correct answer. 3.) Option 3 (the pen) is the correct answer. 4.) The answer is the fourth rod over the bubble. That would complete the pattern 3,2,1,3,2,1. 5.) The correct answer is option number one. Ok so it says on here that kindergarteners do not record answers on bubble sheets? Or sometimes they do, but typically not? My kindergartener said she had to color in the circle for her answer, A, B, or C. Her scores told us she did not require Quest services. She was also not taken with the other two students to take her test. Her teacher had to ask them to test her because we turned in the paperwork/ application on time and it seemed like they forgot. She was taken at a later date than the other two kids in her class, and I would like to know why that would be. I would also like to know if these odd circumstances could have had an affect on her scores seeing as how these events just do not add up to a professional, timely and fair examination of a child’s cognitive abilities.